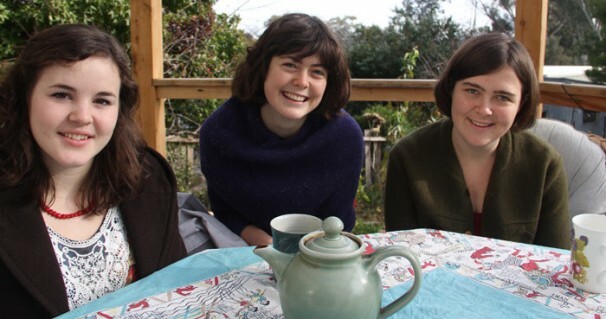 The Mae Trio is the delightful result of the combined talents of three young award-winning musicians fast making a name for themselves in the world of contemporary folk — local sisters Maggie and Elsie Rigby, with Anita Hillman. They possess a grace beyond their years, and write strikingly insightful original songs which they sing in exquisite harmony. The Mae Trio create driving rhythms on banjo, ukulele, cello and bass, interspersed with evocative violin/cello duet arrangements and the haunting sound of concert marimba. Their songs are poetic and melodic, from the lament for a lost banjo to a lyrical tribute to William Morris, and much in between. Maggie and Elsie won the prestigious Lis Johnston Memorial Award for Vocal Excellence at the National Folk Festival 2011. Anita has performed with the successful folk band Evelyn’s Secret, and with the Melbourne Scottish Fiddle Club. With disarming charm in their song delivery, and the spoken introductions in between, this trio is fresh off the blocks and utterly lovely.